President Julia called the meeting to order. Lenny Krasnow led the pledges and Ray Kang gave our invocation of the day. Tillery Castillo led us in saying the Four Way Test. Chris Forrest greeted each member and guest as they arrived, and Maxie DeBlanc introduced our guests and visitors. President Julia led a moment of silence to honor Nadir Abdeladim, Jim Cochran, Past President Bill Gaston, Earnest Gloyna, Jack Mayo, David Sain and Rod Simonsen (all are members we’ve lost since January). Nita Louise Mayo, Jack’s wife, presented a banner to the club from when he served as District Governor. President Julia asked if anyone would consider stepping forward to take over Nadir’s mentor role for Reynaldo, the student he was serving, and to help Rita, his wife, with some computer questions. She then concluded our Memorial by reading a poem in honor of our lost members. President Julia introduced Clay Boykin (and his sponsor Tom Howard), Nick Hesselsweet (and his sponsor Barry Curlee) and Bob LeBlanc (and his sponsor Tarby Bryant) as our newest Club members. Welcome, Clay, Nick and Bob! Ray Kang (sponsored by Andy Swanson) traded in his Red Badge for a Blue one. Congratulations, Ray! President Julia announced we were collecting ballots for today’s Austin Rotary Club Foundation Board of Trustees election. The following five members were on the ballot: Harold Benkoski, Julie Benkoski, Vicky Lindsey, Jack Nash and Jack Wolfe; and three will be elected. Mark Johnson gave highlights of his 10 years as a member during the Membership Minute, including serving the Helping Hand Home as Santa Claus during the annual Christmas party we sponsor for them and past service as Vice President of Membership Services. Jon Yates asked for a few more volunteers for Pecan Springs Elementary School’s Books For Me event and also for some to lead the pledges, give the invocation and/or share during the Membership Minute at our last few upcoming meetings of the year. Conference in San Antonio coming up on May 3-5. Tickets are still available. 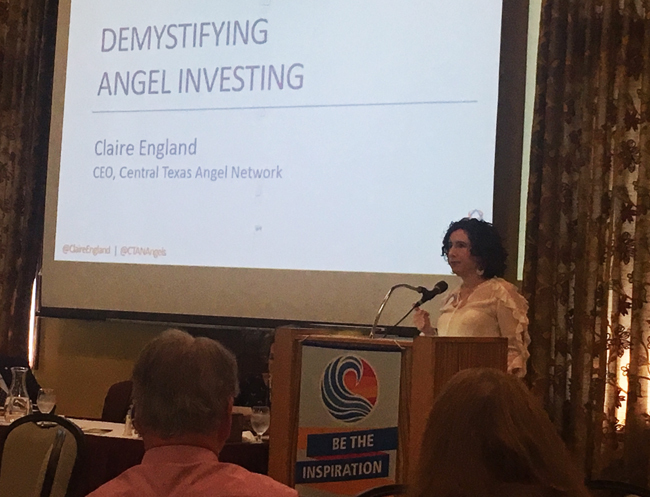 Tarby Bryant introduced our speaker, Claire England, who is the Executive Director for the Central Texas Angel Network (CTAN). Claire said that investing in start-ups is risky but can be very rewarding, and she recommended working with organizations that have experts in a large number of industries. She warned that no one should invest a large portion of their retirement funds and reported that most investments are divided into small sums across a minimum of 10 businesses. She advised that investment diversity is key, investments of $25-50k are typical and of the 10 start-ups in a portfolio, half of them are likely to fail while 3 to 4 will return a normal profit and 1 to 2 are likely to have big returns. A net ROI of 27% over ten investments is typical. Past President and current Board of Trustees Chair Meade Bauer announced the election results for the Board of Trustees. Congratulations to Harold Benkoski, Jack Nashand Jack Wolfe! Next Tuesday (4/2/19) we’ll hear from Chris Almendarez who is the President of the Round Rock Express (Baseball Team); and thanks to Mark Johnson (IBC Bank) and Mike O’Krent (LifeStories Alive) for their support of our newsletter. Optimism is the faith that leads to achievement. – Helen Keller.